Q: Do your controllers use a lot of power? A: No. Apart from a few milliamps (which is very little!) that are required to illuminate the controller LEDs, our controllers use no power. It is the heaters that are plugged into them that consume power. If battery power saving is of importance to you, then you should consider using our low wattage FireFly heaters or use one of our controllers that senses temperature or dewpoint. A: In a nutshell, moisture can condense on a surface when that surface is even slightly below the ambient temperature of the air. This is referred to as the "dew point" temperature. It's quite well defined, and can be measured and calculated to a small fraction of a degree. If there are high levels of moisture in the air, dew forms more easily, and the dew point temperature may be only a few degrees below the ambient air temperature. Telescope optics can dew up surprisingly quickly, effectively ending your observing session. Q: Why do telescope optics dew up so easily? A: One way in which heat is transferred is via radiation. If two bodies are at different temperatures, heat is transferred from the warmer to the colder. The transfer is also dependent on the area that each body "sees" of the other. The larger the angular area, the more transfer can take place. (The nature of the surfaces is also a factor, but it isn't relevant in this case.) Because the telescope objective lens sees a large area of the sky, it radiates heat outward - as the sky is much cooler. As the telescope radiates it's heat to the sky, it cools down quickly. If the dew point is a just a few degrees lower than the ambient temperature, it will drop below the dew point temperature quickly. This causes condensation to form on the lens. Q: How does the Kendrick Dew remover System work? A: The Kendrick dew remover system is designed to eliminate dew from telescope optics by keeping the optics slightly warmer than ambient, or above the dew point. Power is applied from a dew controller via flexible dew heaters, usually wrapped around the telescope tube, near to the cell housing the optics. A gentle and even heat is transferred to the lens. Heat needs to be controlled or it could be too high or not enough. Kendrick Astro Instruments has developed mechanisms to control the amount of heat applied to the dew heaters and these are build into the dew controllers. Q: Which dew controller do I need? Astro Imaging & Serious observing, possible observatory and/or remote control use Premier Controller, 4 individually programmable outputs, 2 with above-ambient temp settings & temp sensor. Moisture sensor to auto-sense dew point, Remote PC control software. Q: Are there any other ways to avoid dew forming? Reducing dust and dirt landing on the optics during normal observing. Kendrick Dew shields are designed to be used with Kendrick dew controllers and heaters. Q: Are there any other ways to get rid of dew? A: The best way is to warm your optics up enough, so the moisture evaporates. We do not recommend wiping optics to rid them of dew, nor using a hair dryer, as this blows dust straight onto them which sticks in the moisture and just bonds more easily to the glass surface. The Dew Remover System is designed to stop it forming in the first place without having to resort to these methods. Q: Other manufacturers claim their heaters have fewer to no hotspots. Is this true? 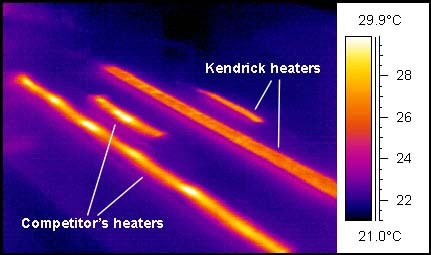 The Kendrick heaters (the top two) clearly show even heating along their entire length, whilst the competitor's clearly show hotspots. The competitor's heaters use thin film elements, Kendrick's do not. The comparative advantage of our heaters is that they can be thermally loaded, unlike thin film heaters. What this means is that 100% of our heater surface acts as an even heater (with no hotspots) and because it can be thermally loaded, it will require less battery power to keep your optics dew-free as it is more efficient. Q: Do Kendrick heaters have any advantages in terms of cabling? A: Yes, we use a special compound tubing made exclusively for us to our specification. We make the cables by hand, and our custom cabling stays flexible down to -40°. In comparison, this works better than the inexpensive RCA audio patch cords our competitors use, which are less durable and get stiff in cold temperatures. Heater cables should not be too thick as they will get stiff and crack in the cold, nor should they be too thin (electrically inefficient & fragile). Our wiring gauge is carefully selected for the wattage of our heaters and hard wired into them. As telescopes are usually equatorially mounted, cable flexibility and connection reliability are serious concerns. Q: I've tested out my new controller and the heater gets quite warm quite quickly, what should I do? A: You are probably testing the heater without being wrapped around a telescope. This is OK and is normal. Under normal observing conditions, your telescope will be set up in cool to cold air. Under these circumstances you will barely be able to feel any heat coming from the heaters as the telescope is acting as a huge heat sink. Q: Won't it mess up the "seeing" or distort the optics? A: We've never had this happen, however, theoretically it can if you crank up the heaters to MAXIMUM for a long period of time. Typically the heaters should be set to keep your optics 2° to 4° above the ambient air temperature. This is not enough to affect seeing or distort your optics. But the point is somewhat moot if your telescope is covered in dew and you cannot observe anything anyway. Q: What is the safest period for running the heater? A: It's difficult to give an exact time period, but it is safe to say they can be left on for a VERY long time. Our heaters are engineered to get to a certain temperature, while uncovered, at room temperature and no higher. They will only get uncomfortably warm to touch when tested in this manner. When the heater is wrapped around your telescope, you barely be able to tell it is on. Eyepiece heaters will feel comfortably warm. Q: My telescope tube gets wet, is it safe to use dew heaters? A: Yes, they are waterproof so they are safe from shorts and internal corrosion from moisture. 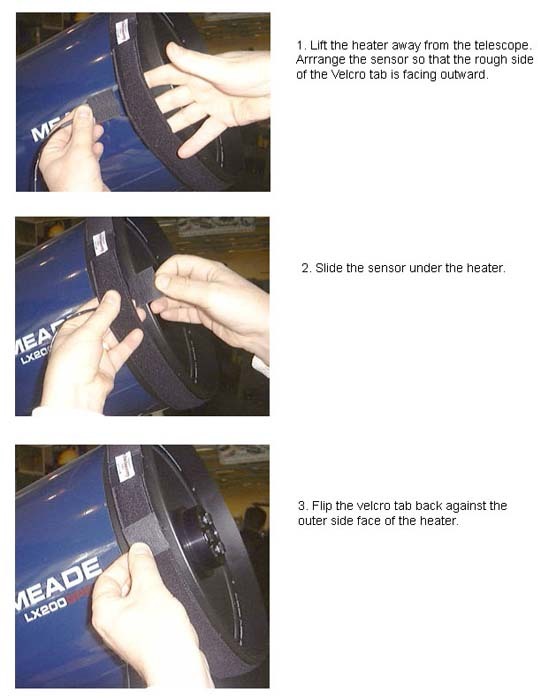 Using heaters will reduce or remove the moisture on your telescope anyway. Q: Surely the Velcro will degrade over time? A: No, ours doesn't. We use the highest grade Velcro that is on the market and it can withstand thousands of pulls. Q: Some manufacturers claim that their dew heaters can be run using a constant current as a cheaper option - to avoid buying the controller, is this a good idea? A: You can run a heater this way, but we do not recommend it. You will be drawing much more power from your battery than is really required to do the job. It also has the potential of creating tube currents due to overheating. Our heaters would need to have their plug modified to operate in this way and it will void their warranty. Q: Can I fold my Kendrick Heaters in half or roll them up into a tight ball when storing them? A: No this is not recommended. Either store them flat or from them into a loose circle and store them in the plastic zip lock bags they came in. Extreme bending of the heaters can cause breakage in the resistive elements embedded in the heater. Q: Does Kendrick have quality control procedures in place for its Dew Remover line of products? A: Yes, every heater is tested to make sure it has the correct OHM rating and their solder connections inspected to ensure proper soldering. Controllers are all tested and the DigiFire 10 and the Premier Controllers are calibrated before shipping for best performance. Q: Can I trim the edges of my secondary mirror heaters (S2, S3, S4, R200SS, or the 2028 & 2028-S) to make it fit better in the secondary mirror holder of my Newtonian telescope? A: No, absolutely not. You run the risk of cutting through the resistive wires embedded in the heater and ruining the heater. Rather, make sure you size the heater properly before making your purchase. Q: My controller LED comes on and seems to be functioning correctly but there is not heat coming from the heater. What is going on? A: 90% of the time the problem is with the heater and is most likely a cold solder connection on the + terminal on the heater RCA Jack which has been pulled loose. Sometimes there is a problem caused by damage to heater body itself. If this is he case, it will be unrepairable, but this is rare. Very occasionally the problem is controller related. In any case, it is recommended you contact your dealer or Kendrick. We have a 2 year workmanship warranty on our Dew Remover line of products. Q: Kendrick controllers are RF shielded for improved Astro-imaging performance. What does this mean? A: A switching electronic device will create RFI (radio frequency interference) if it is not properly shielded. RFI creates digital noise that is picked up by CCD Cameras. This will create image artifacts which degrade the final image. Kendrick Astro Instruments takes this issue very seriously and, with the exception of our MICRO Controller, has built RFI shielding into our entire controller line. Q: Kendrick digital controllers have pushbutton operation, why is this better than dials? A: No moving parts to wear out. Constant, accurate, repeatable performance every time. Q: Kendrick controllers have true digital operation, what does this mean? A: Whilst our standard #2001-SDCC controller is not 100% digital the DigiFire and Premier controllers are. They have no potentiometers and are entirely driven and controlled by the built in IC chips. If a controller has a tunable knob, it is not truly digital, even if it has ICs built into them and will not be as accurate as a 100% digital controller. Also, with a digital controller you don't have to remember the settings in the dark before every observing session! Kendrick digital controllers will retain their settings after being turned off. Simply program it in and that's it, it will start up with the same settings. In the case of the Premier controller, several settings can be saved to take into account different telescopes being used or different observing sites. Q: Where do I place the Optic sensor for my DigiFire 10 or Premier Controller? A: The sensor is placed underneath the heater against the outside of the telescope tube and the Velcro tab is flipped back onto the outside edge of the heater. Q: Where is the fuse? A: It's in the controller cigar lighter plug. 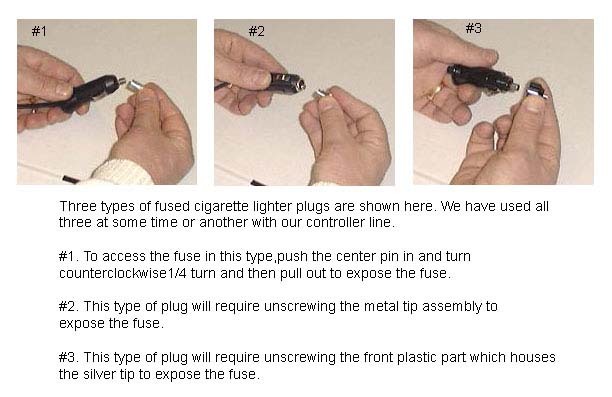 To access it, either unscrew the tip to expose the fuse or, if your tip does not unscrew, push the silver tip in, then turn it a quarter turn counter clockwise and remove the tip to expose the fuse. Q: I want to remove the cigar lighter interface is this OK? A: It can be done but it will void your warranty. If you insist on removing the plug, remember you will need to install an in-line fuse and the controller is polarity sensitive. Hooking the wires up in reverse may damage your controller even though they do have reverse polarity protection. Q: I've lost the instructions, where do I get them? Q: Is it safe to leave the controller running for extended periods of time in my observatory to keep the moisture out? #2001-FL MICRO FireLite Controller No, you should not. #2001-SDCC Standard Dual Channel Controller No, you should not. #2001-7 DigiFire 7 Controller No, you should not. #2001-10 DigiFire 10 Controller Only for the temperature sensing outputs and only with the temperature sensing function programmed and functioning. #2002 Premier Controller Yes, ideal for this, particularly when the dewpoint function is used. Q: Can I use one controller to power heaters on more than one telescope at a time? A: This depends on the size of the telescope. If they are smallish refractors or the like this is not an issue but generally speaking we do not recommend it. Q: Why is my power supply growing warm and is this OK? A: Probably because your power supply isn't build to take the load, we recommend a power supply with at least a 5 amp output, more if your system requires greater amperage, plus a good fuse. Be sure to know the amperage of your heaters when making this decision. Please bear in mind that when using this chart to determine what size of power supply (as opposed to a battery) to choose, you will need to use the full amperage rating of the heaters in question. The heaters will draw their full amperage when turned on and unlike battery operation, the amperage cannot be averaged by the % of your programed controller settings. Q: My heater setup indicates (as an example) I need a 6 amp power supply. Do the heaters draw 6 amps all the time? A: Only when the controller has pulsed on. For example if you have a controller set to operate the outputs at 40% it will draw 6 amps 40% of the time. The other 60% of the time the draw will be zero. Averaged out it will be drawing only 2.4 amps per hour. With temperature or dewpoint sensing modes, the heaters will draw their full amperage rating but only when switched on by the controller. Q: What size battery should I use? A: That will depend on the size of the heaters you are using. Bear in mind that these figures represent the amp hour draw at 100%. The actual amp draw is a factor of your controller settings (1% to 100% depending on controller in use and setting chosen). Please bear in mind that the following table of amp hour ratings is to be considered accurate only if the controller is set at high, or 100%. Under normal operating conditions these ratings can be reduced by 40% to 60% as the typical controller setting is medium to low for the #2001 controller or 40% to 60% for our other controllers. Q: What happens if my battery is low? A: All our controllers all have built in low voltage cut-off control. When your battery gets to a certain voltage, the controllers will shut down, saving your battery from being too deeply discharged. The amp hour rating of your battery. The amp hour rating of your heater (see chart below). The setting of your controller. The formula is: battery amp hour rating / (heater amp hour rating x % of controller setting) x.8. A: Jim Kendrick bought his first telescope in 1992 and quickly discovered the ravages of dew. Frustrated by the almost complete lack of solutions in the marketplace for this problem, he decided to develop a modular, high quality, fairly priced system that would work with all the most commonly used optics in amateur astronomy. In May of 1994, Sky & Telescope magazine, did a very favourable review of the system and amateur astronomers began using it widely. As demand grew, Kendrick Astro Instruments created a greater range of dew heaters for virtually every telescope optic. The original Kendrick Dew Remover System is now sold worldwide, and is recognized as the highest quality system available in the market. Astro imagers, visual observers and professional astronomers have been using our systems for years, and we continue to innovate with unique, high quality products for the Astronomy market.